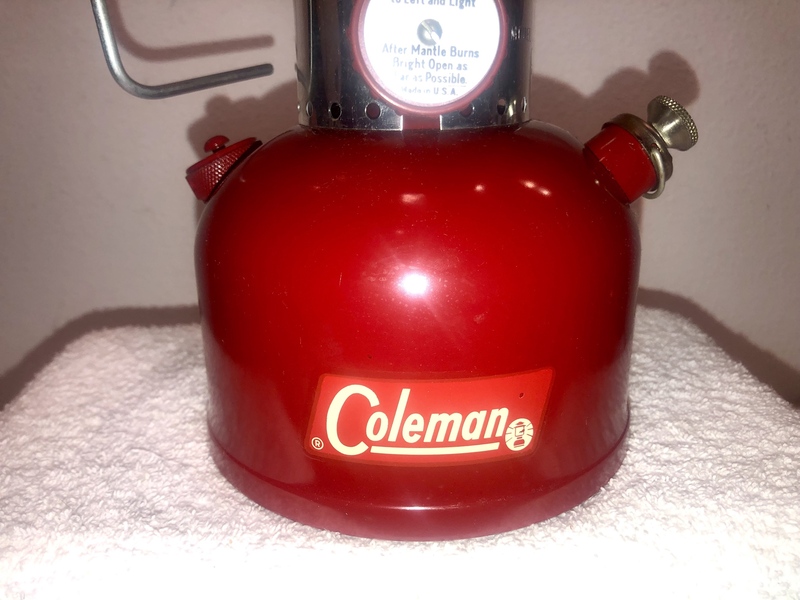 Old Coleman Parts Online Store > Categories > Collections: Restored Pieces and Before & After Projects > UNFIRED! Now that's what I like Warren. I love the gas plants. I’m going to visit another collector in the morning that doesn’t post here. He has one NIB with the Sears funnel, if I remember I’ll take some pics. 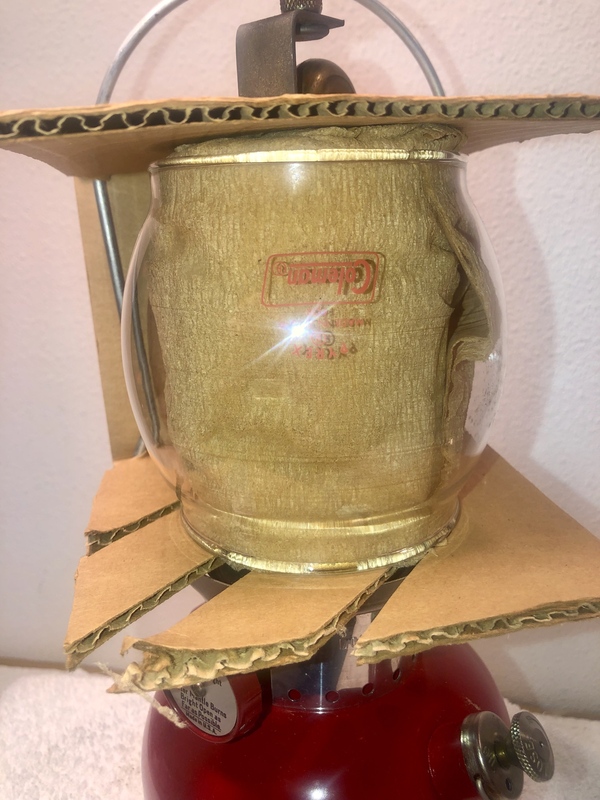 Thermos 8316 Holiday Single. Mantle is marked 715. My unfired: Jan 47 model 236, King Seeley thermos 63 mil-spec, single Kamplite pinky, and 220j may 77 my HS graduation! That 236 is a real beauty...same with the Pinky. This is becoming my favorite thread but also the one that I'm MOST jealous of! I'll play, most of what I had are gone. Many...here are a few recent pics of about 1/3 that come to mind. Little to late for this thread on my end. Here are the unfired backpacker series at work. Sorry the picture is so poorly lit. And where do you work? This thread is going to be awesome!!!! Here is my unfired/unfueled 1975 Coleman 252 mil-spec with all parts. Gary, self acclaimed Cast Iron Camp Cook & Tinkerer. I thought all Avacado Sears came with a frosted globe? As Monty Python used to say, "And now for something completely different". Yeah, they did, this one didn't survive the years but it was a very minty unfired specimen. NIB 1950's Petromax 816 350cp table lamp. Honey would you turn on the dining room lamp, ready to serve dinner. That’s awesome Greg. Does that not qualify as a burg? 502 11/80 Includes the original receipt from Gibson’s for $19.29. No, too late for a Burg. We call it a Maroon. I do have an unfired Burg dated 5/62. Definitely a deeper purple than the 7/62. But it has been unpacked and the brass was shined up by a previous owner. It's probably worth less than this one! I thought it was Cherry after the Burg? I think cherry is after maroon. Cherry 6/62 (its off...) - ? What are the date ranges? any overlaps? Burgundy started around 9/61 to 5/62, give or take. Maroon was the rest of 62. Cherry in early 63. There are no real discrete begin/end dates for any of this. Lots of overlap and always exceptions. The changes were gradual. I've copied your comment to my notes. At least I'll have it closer to reality. 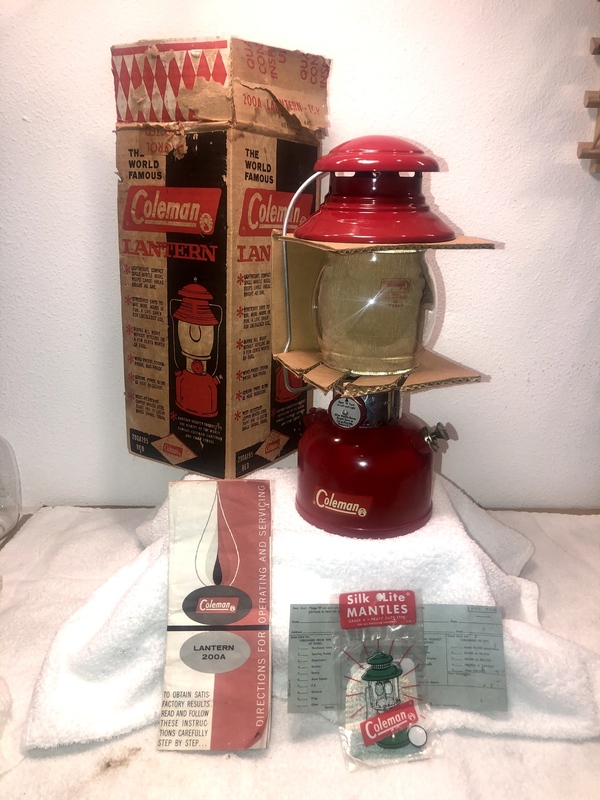 Just grabbed this 220K lantern from a guy today off Craigslist. Unfired and still in the original box with all the original papers and mantles. Build date is 6-83. ...and a couple of 200B's, a 285 and 295 (son's b'day lanterns), but there are already some featured here. So, you have a highly modified DLorean hidden in a small barn in the back yard, right? 😆. That’s the only possible explanation I can think of for all those unfired gems. What is the 3815? I've never seen anything like that before. That’s a propane RV wall fixture, I think. That's exactly what that is. Humphrey made a version for quite a while as well. Really the maroon is the prettiest 200A ever made. That is absolutely outstanding. 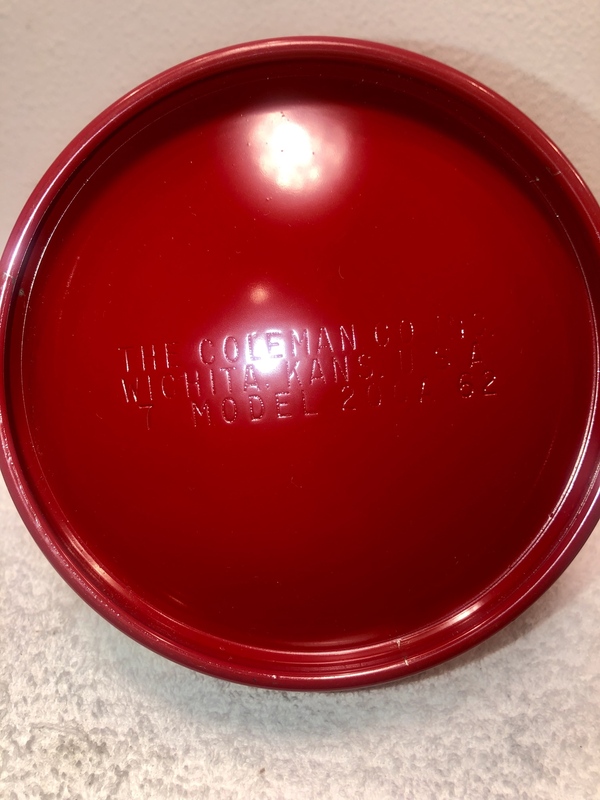 When they are old and worn they look like any other Coleman. But new? they are gorgeous. The paint and porcelain are thick and shiny. any more info on this?!?!? It obviously had some sort of issue when he lit it for me, I think low fuel pressure.